T-shirts with Malaysian slangs, food and anything related has been around for I don't know how long, but, I just discovered them and they just right up my street. In fact, I have a few local brands that's worth to check out if you have the same liking as me. Pantunpins basically have nail it with their pins. Most of the pins have the ol' school vibe to it like the Nokia 3100, old RM1 coins and lots more. If you're a collector of cool pins or you've been searching for unique ones you might want to check them out. WarongSyaza I believe is a recently open online shop on Instagram. I stumble upon their Instagram and it just caught my eyes. The t-shirts are just so cute. They have tiny print and embroidered located near the badge area on a t-shirt. Not just that, there's words at the back of the t-shirt. As seen from their Instagram, they just about to release their sweatshirt that come with two slogan options: makan mana and lapar always. However if you're more into the little things, they're also selling stickers, button pins, bookmark and more. Anything you ever wanted, they have it. HomeTooMuch is the dream. 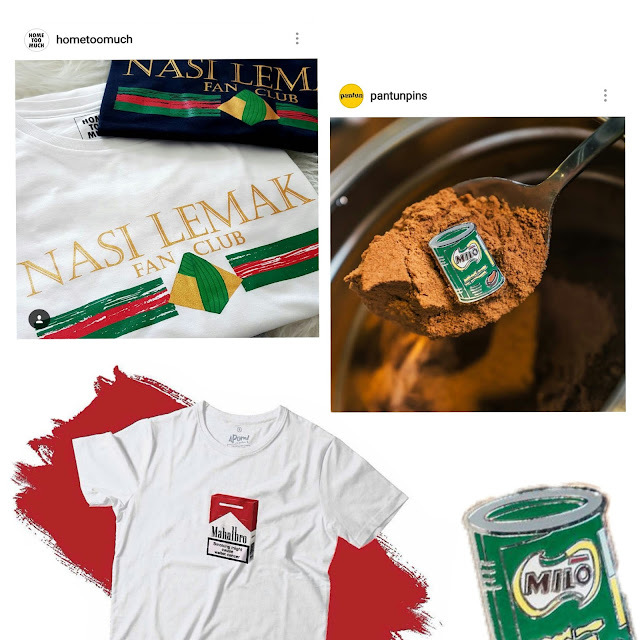 Since the first time I saw their Gucci Inspired t-shirt that says "NASI LEMAK FAN CLUB" on it I died. I couldn't stop thinking about it ever since. I MUST TO HAVE IT. I love Gucci as a designer brand and I love some Nasi Lemak. Literally a perfect combo!